We headed downtown this weekend to find out what’s behind the buzz at one of the most vibrant destinations on the culinary and cocktail circuit – Elvira’s! Our celebrity co-host was Jared McKinley, publisher of the new Meow Magazine, who got us current on his multi-media adventures and the latest news from his garden at Rancho Gatito. We were then honored to welcome Zulema Echerivel-Felix and Patricia Taylor, co-authors of the hot new book Buen Provecho: Treasured Secret Flavors. The stories in this book are just as fascinating and fun as the recipes! Since today was World Cocktail Day, we sat down with Elvira’s bar manager Eric Harding who gave us a sneak peek of what he had planned for a new cocktail menu. One of these beauties was a cocktail made with mezcal and a roasted street corn syrup! 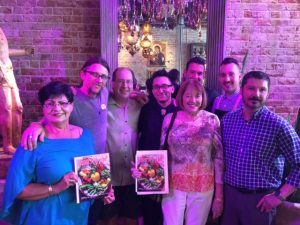 Elvira’s owner/chef Ruben Monroy and general manager Thomas Spooner then walked us through their menu and its regional influences. 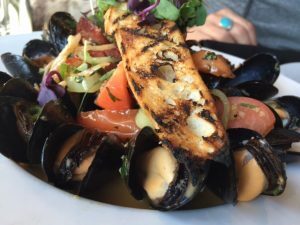 Tasting the baja mussels and a burger inspired by the streets of Barcelona took this show to a whole new level. Baja mussels, with chorizo, jalapenos, chile caribe, white wine, saffron, cream, and grilled baguette. We wrapped up with Elvira’s chef de cuisine Michael Byrer and sommelier Oscar Saenz as they discussed an upcoming Night with Truchard wine dinner. Viva Elvira!